The settlement of Ariel was established in 1978. Its founding population of forty settlers has burgeoned due to its strategic location (close to Tel Aviv and approximately in the middle of the West Bank) and generous government aid to a present population of almost 20,000. Over the years Ariel has been built on land expropriated from nearby Palestinian villages and towns including Salfit, Yasouf, Iskaka, Marda, Hares, and Kifl Hares. The built up area of the settlement covers about 750 acres (3,000 dumans), but its municipal boundaries (areas slated for expansion) cover an additional 2,700 acres (10,800 dunams). It is situated (at its furthest point East) approximately 22 km inside the Green Line, adjacent to the intersection of Israeli bypass roads #60 (which crosses the West Bank from North to South and #5 (the ‘trans-Samaria’ highway). Ariel is the first reported case of colonizing efforts in the Salfit district, which at the present time has a 1:1 ratio of Israeli settlers to Palestinian residents. The Salfit district has become an extremely important location for Israeli settlement policy, and now Israeli settlements (24) outnumber Palestinian villages (22) and cover almost 10% of the land area of Salfit. Ariel settlement is the most well known and largest of the Salfit settlements, and with its own college, municipal court, and police station, has long been thought of within Israeli society as just another ‘town’, rather than a settlement in the West Bank. Some of the factors that help to explain Ariel’s significance within Israeli settlement policy include the abundance of water and agricultural resources in the Salfit district (known as the breadbasket of the West Bank). Additionally, a major ‘Israeli population center’ in the geographical heart of the West Bank ultimately acts as a ‘fact on the ground’, cementing Israel’s control of the area and acting as an impediment to Palestinian territorial contiguity. The presence of Ariel has effectively limited the development of the town of Salfit (pop. 10,000), which serves as the ‘urban center’ for the entire district. The location of Ariel forms a physical barrier for most of the residents of the district who (since the year 2000) must travel around the entire length of the settlement’s municipal boundary to reach Salfit. Palestinian residents from Haris, Kifl Hares, Deir Istiya, Mas’ha, Biddya, Sarta, Deir Ballut, Azzawiya, Qira, Marda, Zeita and Zeita-Jemai’in must travel a minimum of an additional 15 kilometers. Additionally, Ariel’s massive land area prevents the town of Salfit from being able to expand and younger residents therefore have a disincentive to remain once they are old enough to begin having families. The presence of Ariel, it’s large municipal area, surrounding bypass roads, and security apparatus effectively contribute to the underdevelopment of the entire Salfit district by limiting access to most Palestinian residents to the cultural, economic, and municipal resources of Salfit town. In June 2004 land razing began on the lands of Salfit and Iskaka (another village contiguous with the Ariel boundary). This 9 km section of the work is slated to confiscate approximately 6,243 acres (24,972 dunams) from Haris, Kifl Hares, Marda, Iskaka and Salfit, with over 800 acres isolated from the village of Marda alone. Appeals raised in the Israeli High Court temporarily halted the work but it was resumed again on January 24th, 2005. On February 10th 2005, the Supreme Court issued a ‘temporary injunction’ that again halted the work, but that decision was again reversed on May 16 and work has begun afresh. As Israeli peace activist Uri Avnery has recently noted, it is no coincidence that the Sharon government is giving orders to speed up construction of the segregation wall while media attention is focused on the ‘disengagement’. Effectively, in exchange Gaza’s four kilometers, hundreds more will be confiscated inside the West Bank for the construction of the segregation wall. Publicly the Gaza pullout is being hailed as an important step toward a peaceful resolution, however the irrevocable effects of the separation wall are a direct contradiction to this. The Ariel finger, due to its drastic nature has even prompted criticism from the U.S. State Department spokesman Richard Boucher criticized this section in June 2004, saying that it would make Palestinian life more difficult and undermine any remaining chances for Palestinian statehood. In addition to taking their case to the courts, Palestinian residents from the Salfit district have organized popular resistance to the building of the wall. The necessity for grassroots resistance is clear since even the condemnation of the international community, as expressed through the ruling of the International Court of Justice (July 2004) has not succeeded in putting pressure on Israel to stop construction of the wall. The ruling stated that the segregation wall is illegal and must be dismantled, and any damages done must be compensated. The plan for the ‘Ariel finger’ is perhaps one of the most glaring examples of violations of human rights and the environment to date in the building of the segregation wall. Grassroots mobilizations have materialized from effected villages, and assisted by Israeli and international activists, Palestinians have sought to lay claim to their lands and prevent further destruction of their property and livelihoods. Over fifty nonviolent actions have taken place in the Salfit district over the last year in opposition to the wall. 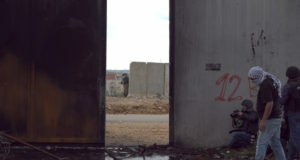 Whether direct actions intended to prevent work from taking place, or symbolic actions designed to deliver a message through media attention, the Popular Committee Against the Wall in Salfit has helped to organize a population that is frustrated from over two decades of being forced to adjust to the negative impacts of the presence of Ariel settlement. One of the villages most directly affected by the presence of Ariel is Marda (pop. 2,000) which is situated directly to the North, with settler Highway #5 forming the other boundary for the village’s built up area. Marda village has suffered a long history of abuse because of the presence of Ariel settlement on the hill above it. Land confiscation, uprooted trees, settler violence, and the effects of pollution from the waste of the settlement are all unfortunate consequences that the residents of Marda have had to contend with. Much of Marda’s agricultural land has been expropriated for Ariel settlement and the bypass road. Farmers from Marda still have pockets of cultivated land within the settlement which have effectively been annexed to the settlement. Additionally, cultivated land that abuts Ariel’s municipal boundaries is dangerous for farmers to reach, and international accompaniment is often requested in these areas. Therefore the mere proximity to the settlement renders additional hundreds of acres of cultivated land inaccessible to Palestinian farmers who are dependent on this land for the livelihood of their families. Waste water created by the settlement has contaminated the underground water resources of the entire district, and in the case of Marda, Ariel’s trash heap is perched precariously on a hill overlooking the village. Since the destruction began on June 1, cutting a swathe across the length of the hill above the village and below Ariel, at least 1,000 olive trees owned by farming families in Marda have already been uprooted. 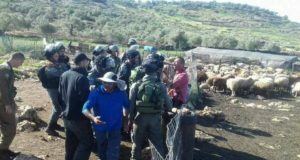 When the work began, farmers, accompanied by International and Israeli activists, attempted to reach the affected lands several times to assess the extent of the damage and to try to intervene to prevent work from continuing. However, these nonviolent activities were met with gunfire from private security guards, and later tear gas and sound bombs from the army. During the peaceful protests that followed (conducted primarily in the village) the army has continued to respond with violence and the village has had to suffer from periodic invasions and curfews as a result. Resistance is made all the more difficult by the fact that Marda’s land beneath Ariel settlement is on a steep hill, making it very threatening for anyone to approach the work. Due to the intense repression by the army, farmers have largely ceased to try to reach the bulldozers. Peaceful demonstrations have continued, organized by the Popular Committee Against the Wall in Salfit, but they are primarily located within the village and do not attempt to interrupt the work of the bulldozers. The small village of Marda is unique in that many of its residents have lived outside the West Bank in Venezuela and are bilingual in Spanish and Arabic. Like the rest of Salfit, agriculture is both a source of income as well as part of the Palestinian cultural fabric. Every family has some land in the proximity of the village and includes family members who are full time farmers. Because Marda residents have been living in the shadow of Ariel settlement for so long, many have the sense that ‘Ariel gets what it wants’. Coupled with the danger of attempting to intervene in the work, the situation leaves village residents extremely worried about their future, while simultaneously doubtful about the possibility of preventing the completion of the Ariel finger. Abu Samih is a farmer from Marda who spent 10 years going back and forth between his village and Chicago. Shortly after September 11 as he arrived in O’Hare airport, he was detained by the INS for thirty days. Planning on applying for political asylum, he decided to return to his home rather than spending time in detention indefinitely. Abu Samih has 55 dunams (about 12 acres) of olive trees that are located inside Ariel’s settlement boundary that he cannot access. For Abu Samih, the presence of Ariel settlement acts as a ‘cancer in the body’ eating away at agricultural land and disrupting the livelihoods of all of the residents of Marda. Still, he is committed to non-violence, and doesn’t believe in harming anyone. With five children total, and two studying at university, Abu Samih is very concerned about the future survival of his family if the Ariel finger is completed. He sees a dire vision of de facto ‘transfer’ for the residents of Marda. Jamila is the eldest daughter of Abu Samih and speaks excellent English. Like her father, Jamila is not optimistic about the future of the village. If the International Court of Justice Ruling means nothing, it is hard for Jamila to imagine what the simple farmers of Marda can do to change their fate. Her wish is to finish her education and get a good job. Despite her worries, Jamila relies on cultural wisdom which says that no matter how bad things get, there is always a possibility that they will get better. She has been profoundly impacted by interactions with Israeli activists who have come to the village to support the nonviolent demonstrations. “When I sit and talk with these Israelis I feel that in that moment I can transcend history,” she remarks. “I do not hate Israeli people”. 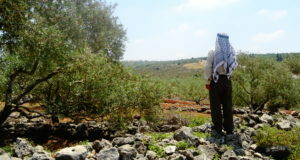 During the Palestinian olive harvest of 2001, Um Amir’s husband Abu Amir was harvesting olives about 3km from the center of the village, on Marda’s land close to Ariel settlement. Suddenly he heard barking dogs and looked around only to see guard dogs from settlement security running toward him. Abu Amir began to run in the direction of the village, trying to escape the dogs. At the edge of the village, Abu Amir collapsed of a heart attack, and died. Um Amir and her seven children lost their father as well as all of their land because of Ariel settlement. They had 20 dunams (5 acres) of olive trees as well as the same amount of land not cultivated with trees that was confiscated in the building of the settlement. She has lost income from the loss of her land as well as the loss of her husband, who used to work in Israel as a metal worker. She is also not optimistic about stopping the Ariel finger. Abu Hassan is the head of the Popular Committee Against the Wall in the Salfit District. Prompted by the negative impacts of the occupation and settlement policy, he and others from Marda initiated a permaculture and sustainable agriculture center in the village that opened its doors in November of 1993. Based on the idea of ‘local resources for local needs’, the center was designed to support farmers to maintain their self-sufficiency despite confiscation of their lands. The center, funded by organizations in Germany, Canada, the U.S., the U.K., Holland and Australia, became a regional hub of training and rural development. Over three hundred varieties of native seeds were cultivated and preserved, and farmers were trained in composting and the use of organic pesticides. Agricultural roads were opened, plants and trees distributed, training courses in irrigation and grey water recycling were conducted. Agricultural engineers from universities all over the West Bank came to Marda to do additional training. The center also provided training courses for women including computer and English language skills. The success of the center and its ability to provide a measure of self-sufficiency for the local population sparked the ire of the occupation forces, including the settler population and the army. On November 8, 2000, at 5:00 a.m., after seven years of successful work, Israeli soldiers invaded and attacked the center. They destroyed the nursery, the seed bank, the computers and all of the files. Some of the activities of the center continue, but they still have not rebuilt the site which is a broken-down shell of its former self and a testament to the vulnerability of Marda, sandwiched between Ariel settlement and the bypass road #5. IWPS is a team of international women working on a project of third party nonviolent intervention in the Salfit district of the West Bank. Living and working here 24 hours a day allows us to witness the effects of the occupation firsthand. Beyond the reach of the media and even Israeli activists, we are in a unique position to be able to document the daily realities of life for the residents of this district, with respect to freedom of movement, the economy, the construction of the wall, settlement expansion, pollution, and other aspects of the occupation. IWPS is available to lead tours of journalists who are interested in this region.